New in the summer of 2017 at Hersheypark is BBLz! If you haven’t heard about it, you’ll want to read on to see exactly what this fun, fizzy goodness is all about! What is BBLz at Hersheypark? 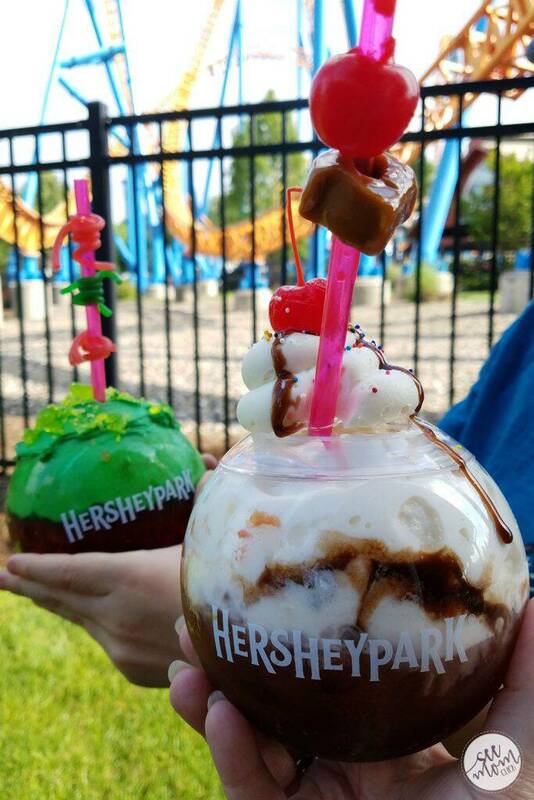 BBLz™ is described as an immersive, multi-sensory beverage experience, and currently the only place in the world you can find – Launches its First Permanent Location at Hersheypark! Mixologists – a.k.a. Bubble Makers –combine unexpected flavor bases, custom-blended foams and sweet garnishes to give guests a delicious beverage experience. Every BBLz beverage combines a soft drink from Pepsi-Cola’s portfolio, such as Pepsi®, Diet Pepsi®, Mountain Dew® and Mist Twst®, with fun ingredients, including Hershey’s confections, such as Reese’s Pieces Candy and Twizzlers Strawberry Twists, to create unique, whimsical beverages. We kind of thought of them as a cross between a soda and a dessert. The globe-shaped cups are super fun to drink from and yes, you can definitely keep it and take it home if you want to! Visitors can choose from seven innovative BBLz recipes, each currently priced at $6.99. I’ve got the low-down on each one below. So fall Melon Baller is our favorite. Which one are you going to try first? MELON BALLER: Get your melon on with this refreshing summer sipper. Mountain Dew®, watermelon flavor, lime foam, blueberry boba, vanilla frosting, Green Apple Jolly Rancher®, and Twizzlers®, Pull ‘n’ Peel Watermelon. FIZZY FLAPJACK: Quench your pancake craving all day long. Mist Twst®, apple flavor, syrup foam, Hershey’s® Milk Chocolate, pancake syrup, mini pancakes, chocolate chips, and bacon. DIZZY DIRT: A decadent chocolate treat with a hint of mint. Pepsi®, vanilla flavor and chocolate syrup, chocolate foam, Whoppers®, Hershey’s® Mint Cookie Layer Crunch, chocolate frosting, gummy worms, and sprinkles. BIRTHDAY KISS: Every day is your birthday with this sweet cake batter concoction. Diet Mist Twst®, vanilla and cake batter flavor, vanilla foam, strawberry popping candy, vanilla frosting, Birthday Cake Hershey’s® Kisses, strawberries, and sprinkles. Where is BBLz in Hersheypark? BBLz is located in Kissing Tower Hill at Hersheypark. If you’re not sure where that is, the easiest way to find it is to look for the brand new Hershey Triple Tower™, an awesome and very tall ride so you can’t miss it, and you’ll find BBLz directly across from it. The funky BBLz structure is two-stories high, topped with a distinctive spinning BBLz ball. There’s a lounge upstairs where you can order your drink and then sip, sip while you watch the thrill-seekers ride the Triple Towers! Stay up to speed with everything that’s new at Hersheypark by visiting their website, and following along on Facebook, Twitter, and Instagram.